It’s a great blogging platform and Content Management System (CMS). In fact, we believe it is the best for the vast majority of users. But it is not without its foibles. In fact, there are still what I would consider to be some pretty big holes in WordPress’ user interface and functionality – the kind of holes that perhaps should have been filled by now. It can be all too easy to rave about how wonderful WordPress is, but it’s still got a way to go in terms of offering a really top notch user experience. 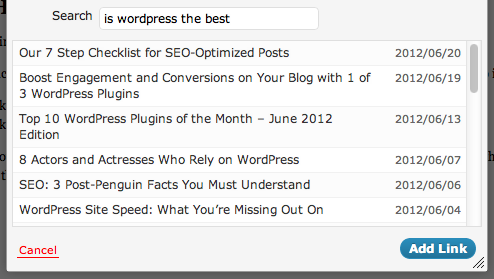 As you no doubt know by now, WordPress 3.4 was released just a few days ago. At the time of writing, it had already received 1.7 million downloads. With it came some one big new feature – the theme customizer. It will be interesting to see how it is utilized by theme developers in the coming months. But there were also some smaller updates, including a little tweak that allowed you to add HTML to captions. It sounds rather inconspicuous, but as far as I am concerned, it has been a long time coming. Just stop and think about it for a moment – HTML in captions. It sounds like something you would take for granted, doesn’t it? 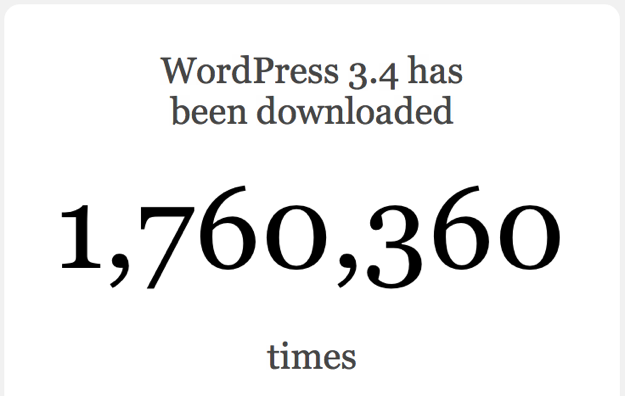 And yet WordPress users had been without such functionality up until just a few days ago. That got me to thinking about the other areas in which WordPress frustrates me. I should make something clear up front – I love the Distraction Free Editor (DFE). I use it 90% of the time, and have written about it before. In fact, I’m using it right now. And yet, it infuriates me at times with its bizarre behavior. In fact, I can name 10 things that the DFE doesn’t get right. 10 is a lot. Those bugs and design issues prevent the DFE from being a genuinely superb solution for online content creation. Instead it is merely good, with irritating bugs. Perhaps I set my standards too high, but I would love to see WordPress knock it out of the park with what is arguably one of the most important elements of a CMS. Code snippets are a great solution for those who want the functionality of a plugin without a sacrifice in speed. It is all too easy to find yourself with a plethora of plugins installed on your site, when some simple code snippets could get a similar job done. But WordPress doesn’t do a great job of promoting the use of code snippets. We are handed a functions.php file, then left to our own devices. The whole point of a CMS is to offer an intuitive user interface coupled with powerful backend customization capabilities, but WordPress essentially doesn’t offer a user interface for code snippets. A recently released plugin does a great job of providing such a user interface – essentially treating code snippets as plugins, to be created and managed. It would be great to see this plugin integrated into WordPress. Think about some of the things you do most often with WordPress. One of them is the simple act of adding hyperlinks. And yet it is a far from ideal task in WordPress – especially when it comes to interlinking posts. WordPress has a stab at providing an easy way to link internally, but the solution is far from elegant. Anyone with more than a few posts and pages can tell you that the search feature leaves little to be desired. 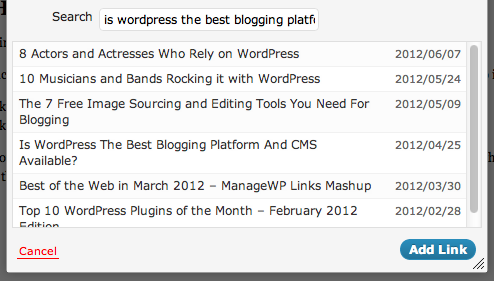 Take the search I attempted above for the following article: Is WordPress The Best Blogging Platform And CMS Available? As you can see above, if I type in “is wordpress the best”, the article is nowhere to be seen. It should be the most relevant result, but it is not. It is actually several scrolls down in the list. Since interlinking is something bloggers do all the time, you would think that a better search feature would be a high priority. It would certainly save me a lot of time. I find it astonishing that WordPress developers haven’t worked harder to create usability guidelines for plugin development. Even experienced WordPress users are often left guessing as to where they should go to work with a new plugin. One of the key drivers of WordPress’ success has been plugins, and yet they are not actually that easy to use. They appear as being stapled onto WordPress, as opposed to integrating seamlessly. Surely there should be some common usability rules when it comes to plugin development? I can see myself receiving criticism for this point, and I’m ready to accept that. 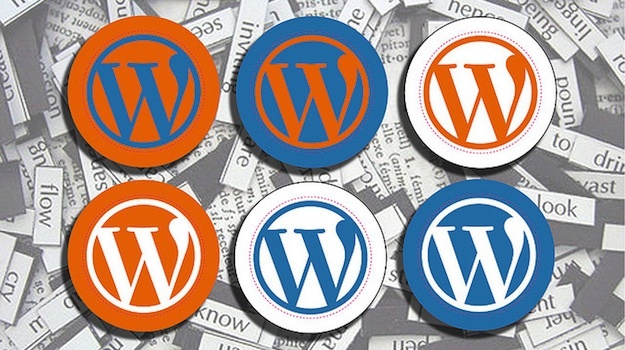 After all, WordPress is first and foremost a blogging platform, is it not? Well, it is – but WordPress is suffering from an identity crisis. I would be interested to see the split of domains that host WordPress websites, and WordPress blogs (and a mixture of the two). What percentage of webmasters are using WordPress to run a website, and/or a website with a blog? A recent addition to the Trac proposes to change “Posts” in the navigation bar to “Blog”, which would certainly be a step in the right direction in clearly delineating WordPress’ feature set. But there is no doubting the focus of WordPress on blogging. Perhaps this is only right, given WordPress’ roots, but then maybe it is time to reassess what WordPress really means to its users. Often, deficiencies in WordPress are rectified by plugins (such as Code Snippets, mentioned above). That is a major reason as to why it is so popular, and demonstrates the enormous power of the WordPress community. However, an over-dependency on our community could mark the beginning of the end for WordPress as the most popular CMS. It must stand alone as a fantastic solution, with plugins that provide the kind of extensibility that would not make sense to include as standard. Plugins shouldn’t be used as band-aids. We shouldn’t forget that although WordPress is open source, there is clear commercial intent in its development. It might be taboo to demand better, but if we don’t break taboos every once in a while, we won’t advance quickly enough. This is a great article Tom. Thanks. I especially agree with your items 1 and 2 and think these could be greatly expanded; for a first time WordPress user, the dashboard/UI is extremely confusing. Unfortunately Plugin coders, Theme designers, WordPress implementers etc. are used to the dashboard and the same inadequacies just get repeated time and again. I implement and configure WordPress Sites and provide beginner WP training and I really can’t describe how difficult it is to explain to first time users why settings are all over the place, why sometimes a Theme comes with a contact form and why sometimes a Plugin is needed for a contact form etc. etc. 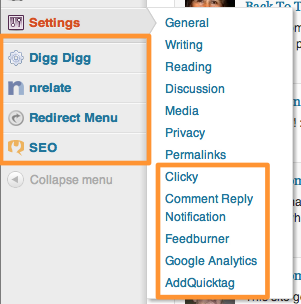 WordPress desperately needs simplification through such things as UI best-practice guidelines. Most of things you pointed out don’t really bother me about WordPress. Until you mentioned plugins. It’s crazy where people decide to stick them and I often feel lost wondering where the settings of a particular plugin can be found. It’s enough to drive me crazy sometimes! A quick solution could be to add an ‘options’ link on the plugins page which takes you to that plugin’s page (if applicable). But yes I agree with you on that point completely, WordPress sort it out..
I’ll be honest, I have only used WordPress a few times, so I wouldn’t know the pros and cons of it. So this is more of a question, rather than a comment. #3 Better linking got me thinking about my own CMS. Does WordPress support dynamic links? Depends on exactly what you mean by dynamic links, but the answer is most likely yes. A dynamic link where by even if you change the page name of the linked page, it would still reference that page. ie. no broken links if updates are done. So instead of a static link like /5-things-wordpress-doesnt-get-right/, it would be a pointer to that page instead so if you ever changed this page name to “10-things-wordpress-doesnt-get-right”, it would still work.